Look at this – it is almost bedtime and I have been too busy working on my WIPs (and other things) to take any WIP photos or put any words together. I shall have to tease instead, because I feel my bed calling to me. And that’s it. That’s all the WIPpage for this week.Â Testing Maia took a lot of time. There is something new and exciting on the near horizon – a commission that will throw spanners in my Colourmart works. I don’t care though, it is going to be fun – and it is for somone that I like very much and will be happy to knit for. I’ll block Maia tomorrow. Look out for her on Friday. Oh – and there’ll be much to show and tell soon – 100 Pure Wool is selling hand-dyed merino yarn at $7 for 100g – look at their 2010 collection. 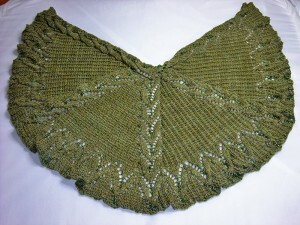 I have stocked up in readiness for the remaining 5 of Romi’s 7 Small Shawls. Next Post Where did my weekend go?